When you stuck on the road because you lock yourself out of your car or your home, you may call us. If you have a broken key that jammed inside your door lock or the ignition lock, our emergency locksmith can deliver on-the-spot solutions, combined with courtesy, and a smile. From lock picking to lock re-key or replace, we have the skill and up to date tools to help you go back on your day, as soon as possible. 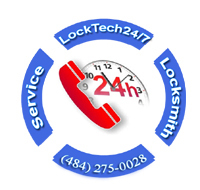 LockTech24/7 is the leading provider of security and locksmith services. We are considered the most trusted emergency locksmith company in Allentown. When you’re looking for the best in the business, look no further. We come to help wherever you’re located in the Lehigh Valley. whether you lock yourself out, broke your key, or your lock stop working properly. We offer fast and affordable mobile emergency locksmith service for vehicle, home and business owners. Our Allentown locksmiths have the expertise to help you get back into your building or car immediately. We are strive for customer satisfaction, that’s why all of our locksmiths are equipped with specialty and state-of-the-art tools. You can back into your home or car, with us, and so on with your day. We service Lehigh and Northampton counties within a fair time frame of 20 minutes. We are your best choice to hire professional emergency locksmith throughout the city of Allentown. Although this is true, we still keep low prices. If you are lock yourself out, simply call (484) 275-0028, and we will be on the way to open your door, as well as to make a new car key to your vehicle. Call us to inquire about our emergency locksmith services, which are available 24 hours a day. We can take care of car ignition key that is jammed or broke, as well as transponder key that’s not working properly. We service all style of auto keys, and we are a mobile company so you can rely on us to come to you. And we are ready to meet your expectations. We can save your money because you don’t need to tow your car to the dealer. No Matter what lock situation you have in your home or your business. Unless specified, we try to repair or re-key the Lock first to save your money, if we can. LockTech24/7 Allentown emergency locksmiths are carrying affordable and heavy duty locks, ready to be installed in your home or your office. We can help you without difficulty to find the security you wanted to protect your family. This includes key-less entry lock, lever locks, door knobs & deadbolts. Our skilled locksmiths in Allentown can also help you with any type of upcoming projects. Including re-keying, lock installation and repair, or security upgrade to your property. In case of an emergency call LockTech24/7. Seriously, we will be there to rescue you from emergency situations in a fashion timely manner. We give you high quality of products, as well as fast and reliable service. We are the fastest emergency locksmith in Allentown, PA.
No need to stress out. If you lock yourself out, we are here to take care of you and all of your emergency locksmith needs. You can always count on us because LockTech24/7 is the fastest locksmith in Allentown, PA.. Our skilled team can handle a variety of lock and key issues for residential buildings, commercial spaces, and automotive. We don’t want our customers to be stranded out in a bad weather because they forgot the keys inside the car. So our emergency locksmith will drive to wherever you are in the Lehigh Valley. And perform the job you need quick and efficient. We always deliver the best service at the most affordable price. So if you find yourself in any of these situations or a similar one, simply call us. And one of our technicians will immediately come out for your rescue 24 hour a day 7 days a week! No matter where in the Allentown and the Lehigh Valley area you might live. We can get to you fast and easy and fix your residential, commercial, or automotive emergency problems hassle-free! Got locked out of your car and need a lockout service in Allentown, PA? Do you need to unlock your 18 wheeler truck? You’ve come to the right place! LockTech24/7 Allentown PA offers wide range of automotive lockout services 24 hours a day across the Lehigh Valley, Pennsylvania, and surrounding area. Call us now for immediate help! When you’ve locked out of your vehicle; whether is a car, SUV, van, or your truck, call the car locksmith professionals at LockTech24/7 Allentown Locksmith 24 hour a day for fast and reliable service! Our automotive locksmith technicians will be at your location within 20 minutes and can handle all types of automotive lock out incidents. You can count on our car locksmith in Allentown PA to get you back on the road in no time, we are only one phone call away. We’ll get the job done fast, so you can access your vehicle and get on with your day as soon as possible! We always provide the highest level of customer service and we’re available 24 hours a day, 7 days a week for your convenience. Don’t hesitate to call LockTech24/7 at (484) 275-0028 and at the same time, enjoy our fast service. Have you lost your ignition key? Do not worry! LockTech24/7 in Allentown, Pennsylvania provide 24 hour locksmiths services and specialize in lost keys services: car keys replacement, car key programming, key fob, broken car key, chip key / transponder key, duplicate car keys, ignition switch repair, ignition switch replacement, and more. The highly qualified technicians of LockTech24/7 have all the necessary locksmith tools and machines, and the experience they need to replace any lost car key even at short notice. Our Locksmiths in Allentown are the top car locksmith company in the city that offers not only outstanding services but also competitive prices. If you ever require service due to a car key replacement, call our 24 hour emergency car locksmith Allentown and a highly qualified technician will take care of your replacement car keys. Does your ignition switch don’t turn to ON position? Locked out of your house or your apartment in Allentown and the Lehigh Valley PA? Does your key stopped turning the cylinder lock? Have you broke the key to your house? You are sized out of your house…now what? It can be well nerve-racking to comprehend you’ve accidentally locked yourself out, nevertheless when you understand who to request for support, you can somewhat diminish your thwarting and get your calm swiftly. LockTech24/7, Emergency Allentown Locksmith Services is here to help you twenty four hour a day, usually within 20 minutes response time! Trust our locksmiths every time you’re locked out of your home because we will get you in fastest than any othe locksmith company. In any kind of situation, whether you locked your keys inside, or maybe your key broke, or lost in a taxi to work. So if you ever happen to be locked out of your residence, don’t panic, and don’t hesitate to call LockTech24/7. Now that you’re familiar with the facility of our specialists, be absolutely sure you programmed our phone number in you cellphone, so you’ll be able to call us intantely. If you find yourself locked out of your business, we are the ones to call! The technicians at LockTech24/7 Allentown Locksmiths can perform any locksmith service for offices. Our locksmiths specialize in opening all commercial locks, broken key extraction and more emergency business lock out situations. Some offices have door locks that require a key, while others have electronic keyless locks, keypads with password control, or advanced biometric access control systems. We can carefully break through any type of access control in order to allow you entry. If you forgot your key inside the office, we can pick the lock wide open. If you break your key in the door lock while attempting to get inside, our locksmiths can remove the key, repair the lock and provide you with a new key. We realize that these situations are serious and need to be handled immediately. You can get yourself out of this situation fast if you call us as soon as possibe. Our phone number is (484) 275-0028, While you are locked out of your business, we are helping many other customers like you, and that’s why we operate 24 hours a day, 7 days a week. No worries! The technicians at LockTech24/7 Allentown Locksmith can be at your assistance within minutes! If you’re having any trouble opening your doors, you can count on LockTech24/7 Locksmith Allentown to help out! Our quick responsive technicians will repair any type of door lock without any hassle whatsoever. Have you got a new upgraded lock for better security? We can help, too! We can travel anywhere within the Lehigh Valley vicinity 24/7 around the clock for complete emergency assistance. You don’t have to exert force to turn the door knob anymore! We’ll fix the issues on the spot, so you never have any problem turning the handles or unlocking the bolt. We repair various model door structures as well. Let the pros at LockTech24/7 Allentown Locksmith to save your day! Door locks vary in structures and shape, which can range from a deadbolt lock to a mortise lock. There are also digital and combination locks which require a great deal of technical skill that we fully possess. Our qualified specialists know how to safely repair each unique model door lock. We can repair a sliding glass door lock as easily as a cylinder lock. Just let us know which door lock you need to repair!